A little late, Okay a lot late, and kinda long. Here is the story of the Great Windham Frog Battle, and some sources for it as well. At this point I’ve only researched this story on the web. As I find more information on this story I will post it. From what I can gather, there is no definitive account of this froggy footnote in history. On a sticky, hot, foggy night in June in 1754 or 1758, the residents of Windham Connecticut were woken up by a god awful screeching noise. By all accounts, the noise was so loud that it woke everyone in the town up. Folks ran out into the green in what ever they had been woken up wearing. For some this meant 17th century peejays, for others it meant much much less. Some of the townsfolk jumped to the conclusion that surely this was the time of judgment and the most reasonable response was prayerful. Others assumed it was a raid by a tribe hired by the French to slaughter them in their sleep. It was either the start (1754) or the middle (1758) of the French and Indian War, after all. As folks listened more closely to these awful noises it was decided that it was coming from the general direction of over the hill toward a local millpond. As such, a motley band of militiamen headed in that direction armed with guns, pitchforks and hoes. Most accounts agree that the assembled men managed to put a united and clothed front in face of the terror that lay beyond. They were not so brave, however, as to cross into the forest that separated them from the terrible noises coming from the pond. They got to the edge of the wooded area and called out to the opposing army, and got no response other than the screaming that had woken them. Come morning, the men folk managed to get down to the pond and what they found were hundreds of frogs. About half of the frogs looked as if they were dying or dead. The common belief at the time (as reported much later) is that because of the drought there was not that much water, and a battle over the remaining pond space was what caused the racket. It is important to note that the fear of a tribal raid was not that crazy an assumption. The town of Deerfield, Massachusetts had been burned to the ground by the Pequot Nation about fifty years prior. Fifty-six townsfolk in Deerfield were killed during the raid and the remaining citizens were forced to walk to Quebec so that the tribe could be paid for their captives. Furthermore, as the French were paying for English settlers scalps and captives, the British colonists were paying for the scalps of tribesmen. The brutality on both sides astounds. Named characters in the story. The insertion of Lt. Colonel Eliphalet Dyer and Jedidiah Elderkin into the narrative, I suspect came later than the story itself. Both were lawyers in the town. Both served in the Revolutionary war at some point and Lt. Colonel Dyer definitely served in the French and Indian War. Dyer in 1754 was also pushing for Connecticut to have control of Michigan. Who knew? In some accounts of the story Dyer and Elderkin are running for a political office in town. In this version the frog noises are interpreted as calling out “Dyer” and “Elderkin too.” And so the frogs battle over the candidates. Other accounts have the frogs calling out those names, and the villagers figure the Colonels are being called out because of their roles in the French and Indian war. This heightens the townsfolk fear of an Indian raid. Many accounts mention of Pomp, an African-American servant in the household of Pastor White. It is unclear as to whether or not Pomp is a free man or a slave. My 21st Century self hopes that he was free. My historical self knows that in 1754 or 1758 in colonial America, chances were that Pomp was owned by the Rev. White. Pomp is important to the story because he is often named as the first person to hear the ungodly sound coming from above. He is awake and walking home from meeting with a lady, and upon hearing the noises he runs to wake up the Reverend. Another African-American, mentioned, though not often named, is the skeptical voice of reason amongst the believers. He is an older gentleman and points out that it can’t be the Biblical Judgment Day as these awful screams are happening at night, not during the day. Frog noises? Really? What noise could a frog make that could not only wake a town but convince a townfull of otherwise sensible New Englanders that the end was near. THIS is what a normal bullfrog mating call sounds like. THIS is what a ticked off or very frightened bullfrog sounds like. Imagine a pondfull of croakers making that noise. Bonus random frog. A frog named Elvis being cute. The Windham Bank issued banknotes with the froggies on them, so the Mansfield Numismatic Society has a good account of story. Here is plausible explanation for the battle itself. Here is what the Windham Historical Society has to say about the croakers. Here is a retelling of the story from the book Spooky New England by S E Schlosser. Here is the account by David Philips. And this one here gets my vote for the most racist account of the event. No date is ascribed to when this account was written, but I’m guessing sometime in the 1800s. Before I discuss the lessons, I would like to state for the record, that the Durham Fair is waay better than the Big E. I know that for some thems fighting words, but if you are there for the crafts & creatures, the folks at Durham are much better at displaying them. The professional vendors are all in one place, and while they are not given short shrift (being right there near the first entrance) they are not the main focus of the fair. 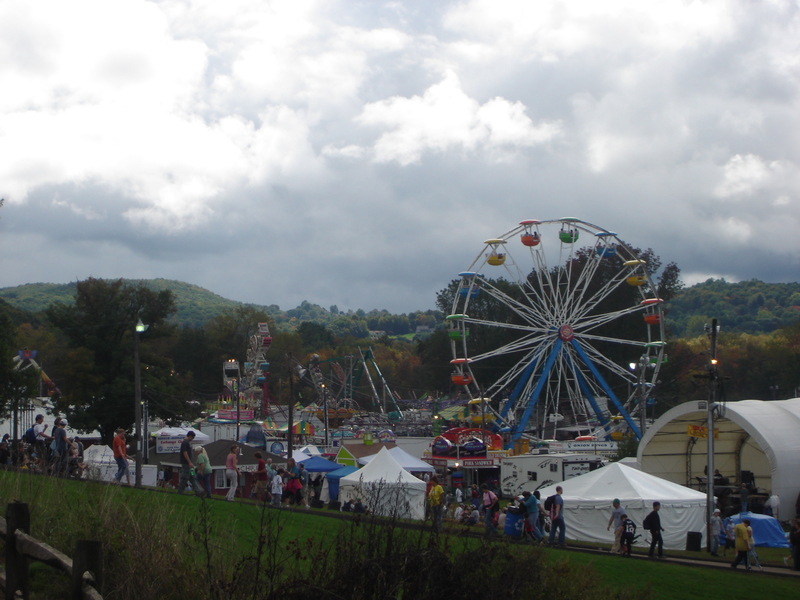 Many of the food vendors are local fire departments, scout troops and churches. If you aren’t careful you might find out that a political party you oppose makes a fine apple pie. Lesson 2. Understand the performance space before you tell. The Potbelly Place at the Farm museum was set inside a museum display. The Farm museum is a barn like building with a concrete floor. The performers were to the right of the main entrance. People were coming and going, to-ing and fro-ing. Most of the folks at the fair had been coming to the fair for years, and were coming through to see all the old stuff at the museum. There was no real place for an audience to stay for the listening. The day before I performed, four gentlemen who sat around and spoke about the Hurricane of ’39 pulled in a great crowd. Their advantage was that there were four of them, and when one ran out of material another could jump in, like a real conversation. The problem with the space as a performance storyteller was just that, there was very little space–physical or mental–to perform. Very few people were interested in watching a performance. That’s pretty self explanatory. I dug around my local history for a story with a hook for weeks and found little that appealed to me. So I gave up and stole borrowed someone else’s. 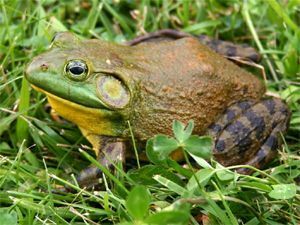 The good folks over in Windham, Connecticut have a great story involving a frog battle and the French and Indian War. (I’ll post more about that story and my sources tomorrow.) The best thing about that story, other than it involves frogs, frog noises, and villagers running around in various states of undress in the middle of the night, is that it can be structured like a ghost story, and if I know anything, I know my way around a ghost story. Regardless, the story was about a fifteen — twenty minute story. Which was the right amount of time for holding anyone who kinda wanted to hear the story, but kinda wanted to look at the old stuff as well. With the right conditions and the right audience willing to make frog noises one could stretch it out a bit, but with people passing by, the smithy clanging metal together in the back ground, I needed the story to move along, or my audience would move along. And well, after that story, I had nothing. Nada. Zip. See the big plan was ease from the Connecticut story to the Star Island stories, but people were just passing through. Since the crowd handful that had gathered continued to wander after the one story, and it was hard enough pin down another handful, jumping into a collection of stories about New Hampshire pirates seemed a little silly. Lesson 4. Learn more stories, doofus. I need to start asking around locally for more good stories. I should know better than to rely on written accounts. And by the way, Lesson 1 was Four Year Olds are a tough crowd. I’ll be telling tales about the history of Connecticut at the Durham Fair this Sunday. I’m looking forward to it and shaking in my boots about over it. Wish me luck. Since th’ gold be not washin’ up on me shores, an’ me not chargin’ fer me tall tale tellin’ ways just as yet, I been on th’ lookout fer employment. T’ tha’ end I be writin’ an’ rewritin’ me resume. In workin’ it over I decided it be needed more o’ a swashbucklin’ feel. An’ so here be me Pirate Resume. Hire as ye see fit. Objective: I’ll be combinin’ me scallywag trainin’ wi’ me world travlin’ an’ me tale tellin’ skills to acquire more gold, silver an’ bennies. An’ to sail the seven seas. Yaaaaarrrrghh! Indocrtinatin' the wee sea dogs for a life of pillaging. 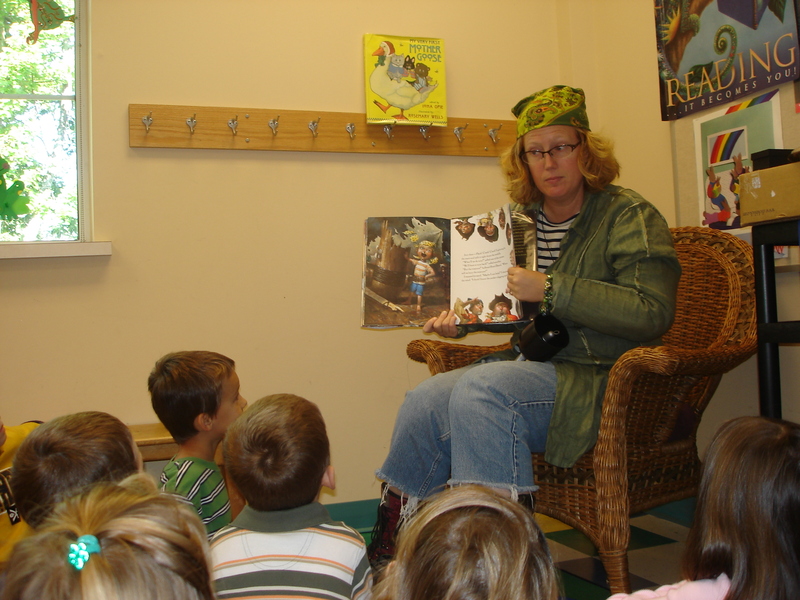 I celebrated Talk Like a Pirate Day a tide early wi’ a crew o’ young sea dogs in th’ local library. Th’ wee ones be skeptical o’ me piratin’ ways, an’ accused me o’ bein’ a pretend pirate. They pointed t’ me utter lack o’ a swashbucklin’ ship as evidence. I claimed that since I be a pirate any vehicle I be captainin’ be a pirate ship, includin’ me beat up Subaru. They then pointed ou’ that I kept handin’ them me hook hand so I could turn th’ pages o’ th’ book, an’ I had t’ grant them that point. They be an enthusiastic crew, none th’ less. They listened t’ stories, learned proper shipmate phrases, shouted them wi’ enthusiasm, an’ sang sea shanties at th’ tops o’ the’r lungs. T’ end ‘t all, Captain Joni helped th’ crew make proper treasure boxes, so that they could hide booty in style. Season 3 of Heroes starts soon. I started watching this show in earnest during Season 2. In an attempt to catch up with all the story threads I may or may not have missed, I’ve watched the entire first season of Heroes in less than a week’s time. Having filled myself up with Season 1, I’ve kind of forgotten Season 2, and have started refreshing my memory with the final few episodes. and chasing Peter Petrelli. The ability to bend time and space combined with invisibility, render the younger Patrelli awfully hard to keep track of. Which is unfortunate because he has to save the world. Now the actors who populate the Heroes universe are universally dreamy, and so having them wander through my almost dream state isn’t such a bad thing. But they don’t leave room for the characters that I would like to bring into being. Fearless Phyllis hasn’t made an appearance since she conquered Bad Beard’s bad beard. Wrong Way Kay is still lost in some meadow. And on top of that I still have to come up with historical stories for the Durham fair. I’m considering going on a story fast. No stories other than my own for a while. Allow my characters repopulate my imagination time. Visit with the ghosts of Star Island. Find a historical character with whom I can travel to Durham in 18th century. Hang out with my flea friend, Phyllis for a while. Who knows what will happen. Furthermore, I’ve head stories of ghosts hanging out at bonfires past. One Pelican (a nickname for young people who work on island) almost left after she saw people “who weren’t there” sitting across from her enjoying a bonfire with the rest of the staff. This Pel was new to the island and folks had to explain that ghosts were not uncommon on island, and were nothing to fret about–unless one is alone in Cottage E, or walking back to the hotel alone past Tuck monument, or trying to scare yourself at the Beebe cemetery, but more about those ghosts some other time. The point of all this is. I’m quite sure that that green blob is just smoke. But, it is kind of cool to think that ghosts show up to listen to stories about themselves.